This weeks accidental theme is TURQUOISE! 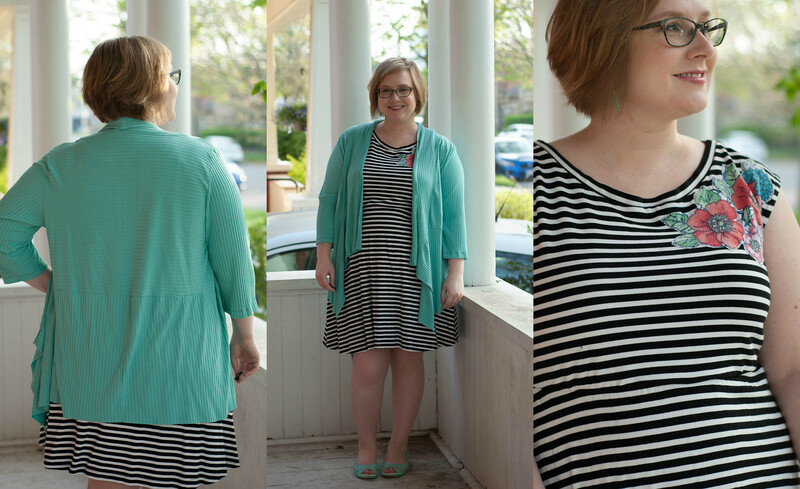 May 14: Concord draped cardigan from last summer, and a Comino Cap dress from 2015! This is one of the oldest dresses still in my closet, and I still love it! The fabric is a beautiful thick ponte, and the flowers were appliqued on. 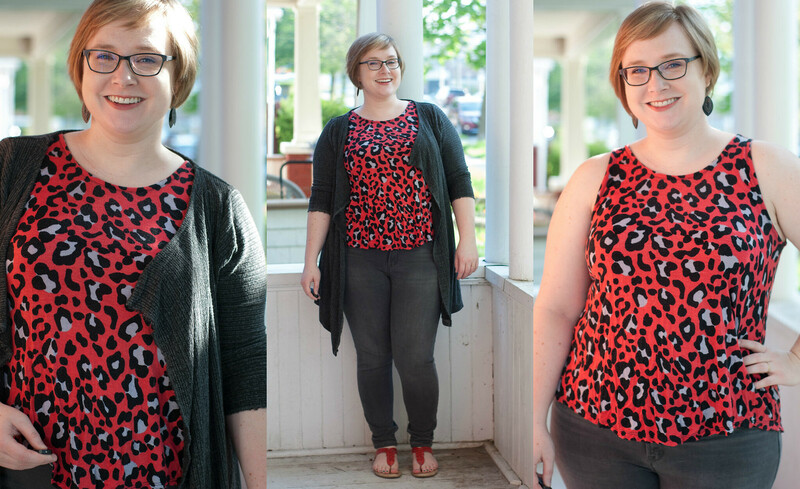 May 15: Santa Fe tank, Ginger Jeans, and a grey cardigan when it got cold! Lots of oldies here! The jeans are at least 3 years old, and the tank is one of my most-worn versions of this pattern from 2 years ago. It was chilly and rainy, so I threw on a 1993 Gortex jacket, bought when I was 13 and no longer able to zip closed over my hips, but other wise still pristine! I also rewore the light grey COncord cardi I made last summer, so I guess that is my “something new”! 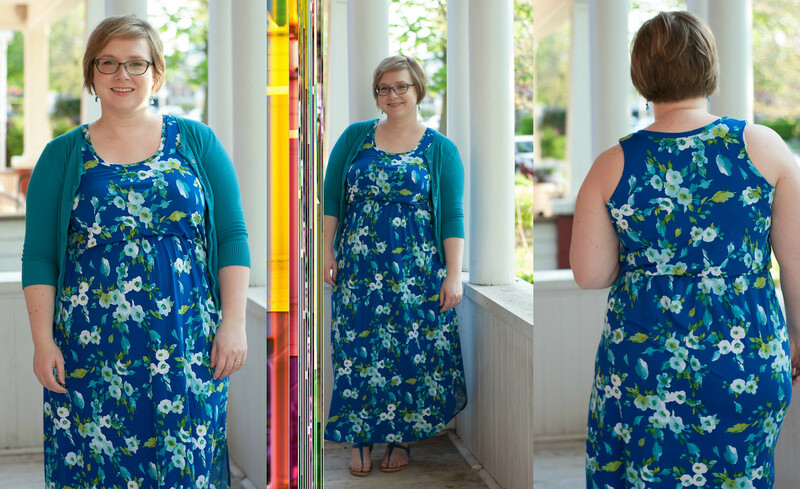 May 16: Jalie maxi dress from last summer, and thrifted cardigan that is at least 5 years old! Bless a good thrifted cardigan! When I find the right colour, I wear them for years. The maxi is a favourite, too. 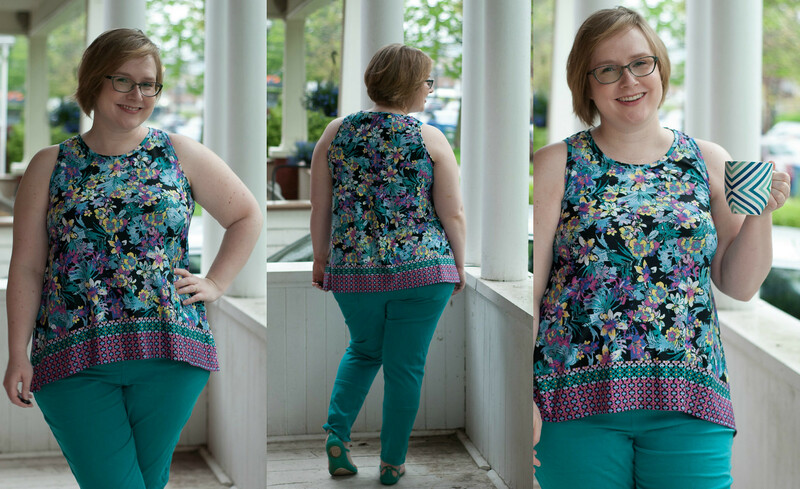 May 17: RTW jeans, never blogged Concord cardi, and refashioned Santa Fe top! I spent part of the day helping my dad put together the new Nordictrack elliptical we just bought to replace our old one… so I went for practical dressing! This tank was a dress, which I cut into a tank and now gets worn more often. The cardigan was an experiment with a different style of waterfall cardigan, but I don’t love it. Something about the shaping of the drape around the neck isn’t my favourite. Remember that Nordictrack I mentioned? All the cardboard is hanging out on our porch until we can take it to the dump… and I was too lazy to move it for pictures! I mean… much-worn Espresso jeggings and a Tessuti Mandy Boat tee. 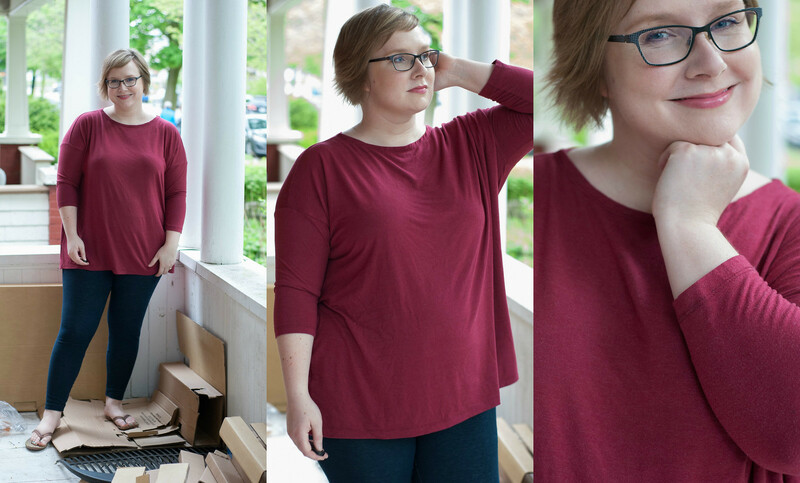 I made a couple of these are pyjama shirts in the winter, and they are very nice to wear on a lazy day! 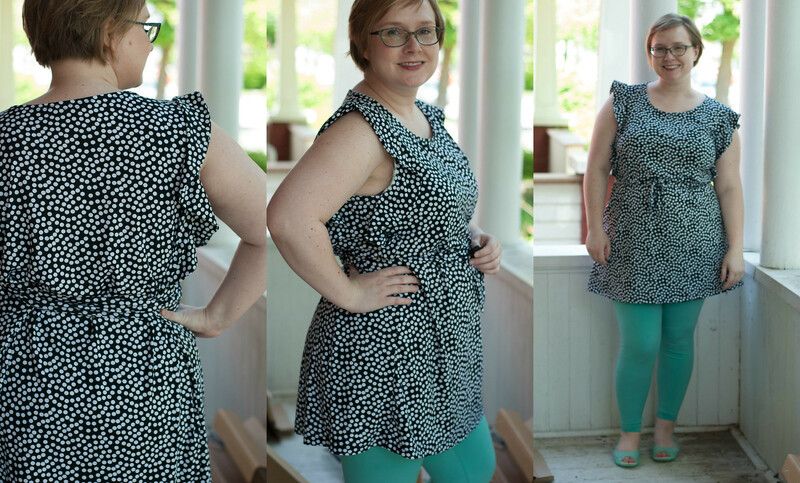 May 21: Upcoming top/tunic pattern, and some Espresso leggings! When in doubt, wear Espresso leggings!!! I’m not a tester for this pattern, but I got a sneak peek in advance. I muslined it in this eye-dazzling ITY polkadot print, which completely hides the pretty pattern details! Next week is an exciting one for me: I’m presenting about the Better Pictures Project at the Pattern Review Weekend in Stratford, Ontario! But what to wear??? Go read my post over on Thread Theory’s Blog! Not MMM related, sorry, but a serious question about the nordic track. Do you find yourself using it? I’ve been thinking about buying something like that, but I’m afraid it will just sit there and be a junk hanger. And do they take up a ton of space? My house is small (by American standards, at least–less than 2K sq. feet). Looking forward to hearing your talk at PR weekend!! 👏👏👏I’m so excited for the whole thing! See you Friday!!! !